Fall in love with the natural beauty of the Amish West Lake Mission Bar Stool. A thick, richly scooped seat supports you as you sit, with an elegant rope molding running along the top rail of the stool. These mission bar stools make attractive additions to your kitchen counter, bar or island. Mission style furniture offers a beauty in its simplicity that never goes out of style. The straight lines and flat panels incorporated within the design accentuate the beautiful grain of the wood you select. The West Lake Mission Bar Stool is shown here in quarter sawn white oak with a Michael's cherry stain. Quarter sawn white oak wood displays small markings or flakes that result from the unique way the oak log is cut, adding to its appeal. 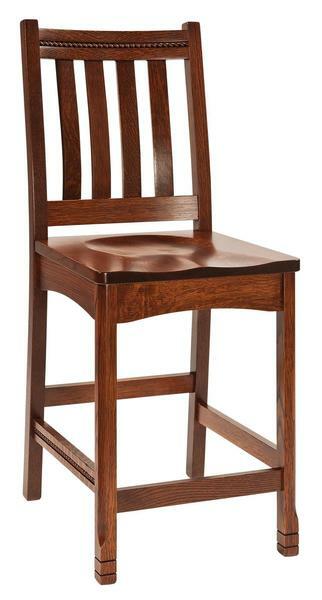 Enjoy the convenience of solid wood bar stool seating that comes in handy for casual dinners and festive gatherings. Provide a seat for the kids to do homework at the kitchen counter or to keep you company as you get dinner ready. Be sure to review our entire line of Amish Bar Stools and Counter Chairs to find the style you like best. Customize these Amish made bar stools in the wood and stain of your choice. Select the Amish West Lake Mission Swivel Barstool if you would like this stool with the smooth swivel option. Call one of our Amish Furniture Specialists today, toll-free at 866-272-6773 with any questions. Back Height from Seat: 19"
Shown in Quarter-sawn White Oak with Michael's Cherry Stain.